Check Out CAC Apparel for Christmas Gifts! Please visit the CAC apparel shop for CAC and Cathletes chapter gifts. Visit www.cathletestore.org or click on the red button on the right side of the CAC site! Since the launch of its new Vin Scully Rosary audio CD on September 26, Catholic Athletes for Christ (CAC) has been highlighted in several major national U.S. and Catholic news media sites. Click links below to read! 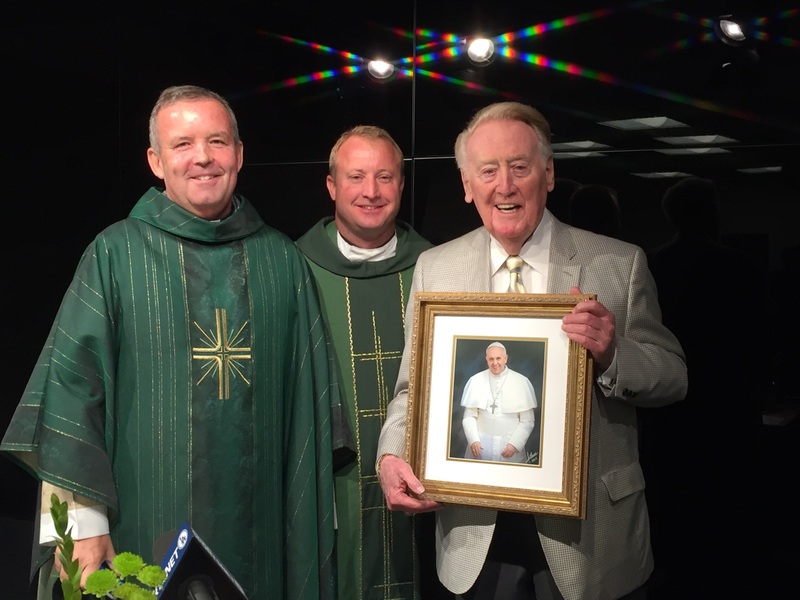 Earlier today, the final Los Angeles Dodgers Mass of the season included a presentation to legendary Dodgers broadcaster Vin Scully, who was a regular attendee of the Mass. CAC organizes MLB Masses across the country for 26 of the 30 teams on homestand weekends. CAC MLB Ministry Coordinator Kevin O’Malley presented Scully with a framed print of Pope Francis and thanked him for his support for CAC over the years and for his recent work on a new audio recording of the Most Holy Rosary of the Blessed Virgin Mary to help raise funds for CAC operations (click here to order). The Mass, concelebrated by Rev. Tim Klosterman and Rev. Steve Davoren, was attended by more than 40 players, coaches, stadium workers, broadcasters, and media officials. This weekend also marks the first time in history that all 15 MLB home stadiums were hosting a Catholic Mass. Vin Scully (right) with Rev. Steve Davoren (left) and Rev. Tim Klosterman (center) following the Dodgers Mass on September 25, 2016. Scully holds a framed image of Pope Francis presented to him by Catholic Athletes for Christ. New York Mets second baseman Neil Walker, along with several former MLB players (Tom Carroll, Cincinnati Reds and Jim Hannan, Washington Senators), provided baseball instruction to nearly 50 boys and girls at Catholic Athletes for Christ’s 2016 Catholic Baseball Camp at Bishop O’Connell High School in Arlington, Va., on June 28. Following a morning Mass and brief testimonial provided by Walker, the baseball campers were led to the field for instructional stations on hitting, bunting, fielding, pitching, and catching. At the end of the morning camp, a brief Catholic talk was provided by CAC Cathletes Chapter Coordinator Dan Duddy and the camp was closed with final words from Walker. The camp was CAC’s second in the past two years, providing an opportunity to grow in the Catholic faith and improve baseball skills. A gallery of photos from the camp can be found here. CAC 2016 Catholic Baseball Camp Registration Now Open! 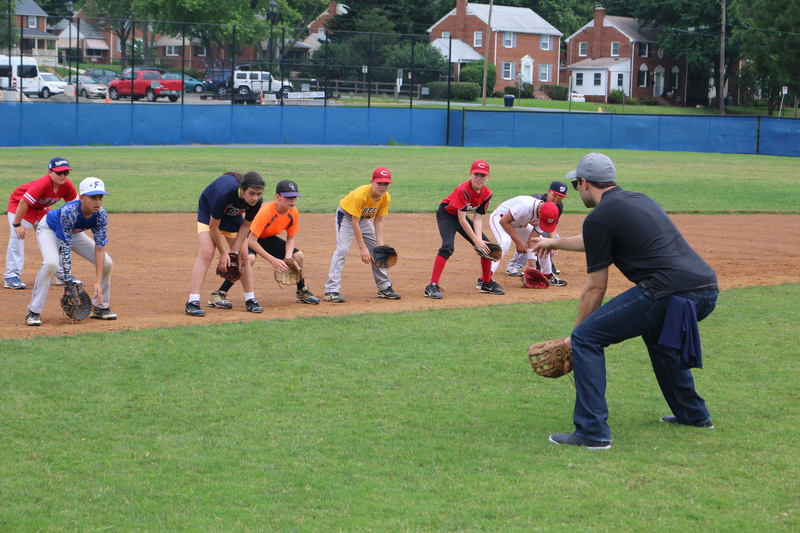 Catholic Athletes for Christ (CAC) is hosting its second annual Catholic Baseball Camp on Tuesday, June 28 at Bishop O’Connell High School in Arlington, Va. The camp is open to ages 8-16 and will run from 8:30 a.m. until 12:30 p.m. The cost for the camp is $65 for the first child and $50 for each additional sibling. The camp is limited to the first 80 campers so please sign up quickly! All campers will receive a CAC t-shirt. 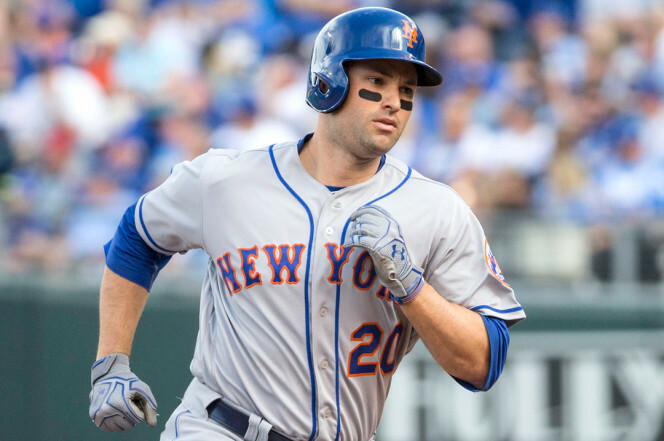 New York Mets second baseman Neil Walker will appear, as well as former MLB players Tom Carroll (Cincinnati Reds) and Jim Hannan (Washington Senators). Other former MLB players are also expected (schedules permitting). 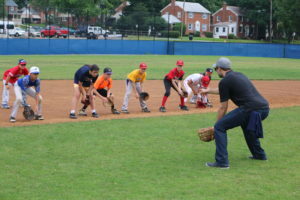 In addition, priests, deacons, and seminarians on the DC Padres baseball team will assist in the instruction. The camp will include Mass held at the start of camp with confessions available, talks highlighting the Catholic Faith and vocations, and instruction by current and former MLB players. For more information on the camp or to register, please call (703) 239-3070 or email Ray McKenna at ray@catholicathletesforchrist.org. Click here to view/download the camp flyer. Click here to complete camp registration form. To pre-pay for the camp (encouraged to streamline check-in), select option below and pay via PayPal. Attention Green Bay Cathletes! 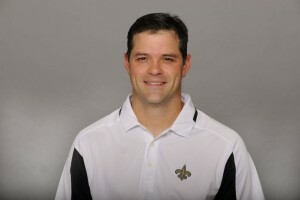 Join Joe Lombardi — CAC speaker, New Orleans Saints coach, and grandson of legendary Packers coach Vince Lombardi — at the 2016 Spring Gala of the A&A Alexandrina Center in Green Bay, Wis., on Friday, April 22 at the Tundra Lodge Resort in Green Bay. Doors open at 5 p.m. for Silent Auction and Raffles and Dinner will be served 6:30 p.m.
Tickets are $30/person. The event is a fundraiser to support the pregnancy crisis center. For more information, visit www.greenbaypregnancyhelp.com/2016-spring-gala/. 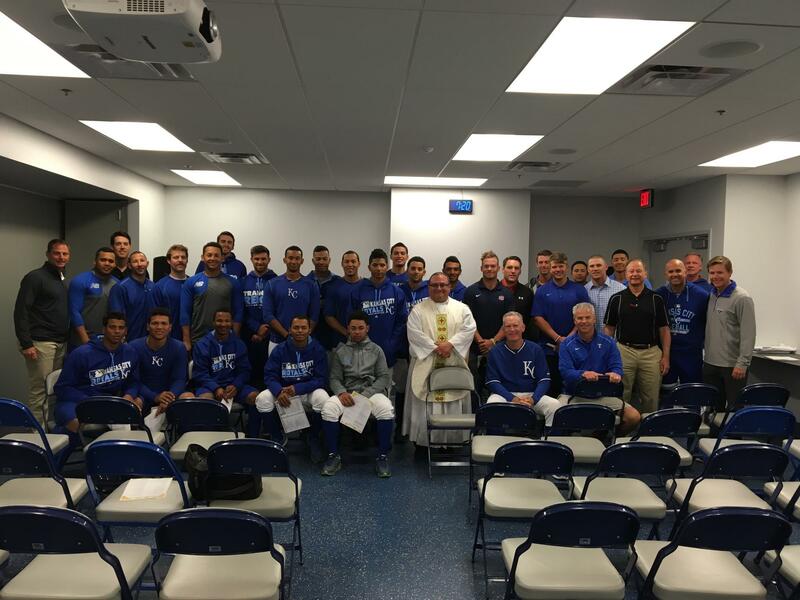 Kansas City Royals and Texas Rangers attendees at the CAC Easter Sunday Mass in Surprise, Ariz.
CAC President Ray McKenna (l) and Cubs priest chaplain Rev. 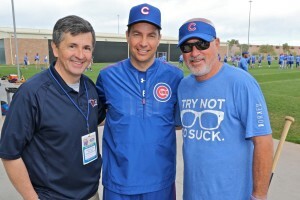 Burke Masters (c) meet with Cubs manager Joe Maddon at the Cubs spring training facility in Mesa, Az. In preparation for the upcoming Major League Baseball season, CAC and several of its Catholic priest chaplains are visiting with players, coaches, and team personnel both in Arizona and Florida. In addition to celebrating Masses for the teams, CAC officials and the priests are visiting with players and team officials and preparing teams for the upcoming season’s Mass ministry. In addition, CAC is introducing itself to each team’s new players and coaches. To view photographs from the 2016 “Men In Black” tour, click here. Leading up to Super Bowl L on Sunday, Catholic Athletes for Christ (CAC), the Knights of Columbus, the Oakland Raiders, the Raiders Foundation, and the Jack Del Rio Foundation partnered on February 1 to distribute warm, new winter coats to needy children in San Francisco, Calif. CAC, the Knights of Columbus, and the Jack Del Rio Foundation hosted a similar charity event in 2014 in Jersey City, N.J., just prior to Super Bowl XLVIII. 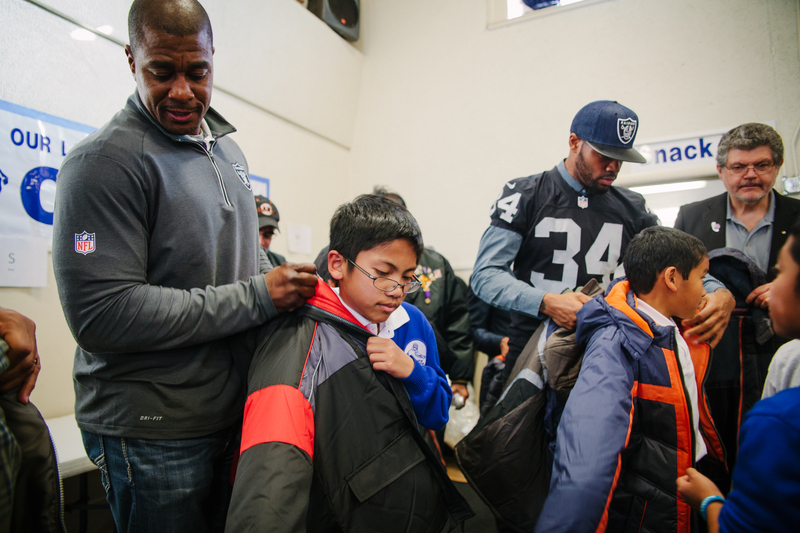 Yesterday’s “Coats for Kids” event was held at Lady of the Visitacion School in San Francisco and coats were distributed to students, the vast majority of whom come from low-income households. The event featured several Oakland Raiders players and coaches as well as National Football League Hall of Famers Dave Casper (Oakland Raiders) and Anthony Munoz (Cincinnati Bengals). Catholic Athletes for Christ (CAC) congratulates Mike Piazza on his election to Baseball’s Hall of Fame on January 6. 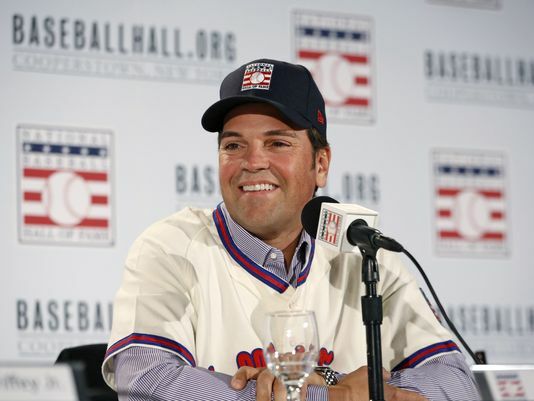 Piazza will be inducted, along with Ken Griffey, Jr., on July 24 in Cooperstown, N.Y. Toward the end of his career, as well as throughout his retirement from the game, Piazza has been active in promoting and advancing CAC’s activities, especially its Major League Baseball ministry.